For many years, many people have challenged the appropriateness of government funding of Planned Parenthood because the organization concurrently has received both funding to counsel pregnant women and to perform abortions. It is a basic principle of ethics that one cannot have any self-advantageous incentive, financial or otherwise, to counsel another person about a moral decision of such great magnitude. Elected by voters set on eliminating taxpayer-funded abortions, President Donald Trump recently has called on Planned Parenthood to separate its abortion business from its other services in order to qualify for continued government subsidies. This accommodation satisfies the longstanding and bipartisan federal policy that prohibits taxpayer funding of abortion – a policy that is supported by most Americans. Planned Parenthood’s current extensive provision of abortion procedures (they are the largest abortion provider in the S.) sets it outside the acceptable parameters for receipt of federal government monies. At Planned Parenthood, tax dollars currently subsidize “pregnancy counseling” services. This “counseling” gets taxpayer-funded reimbursement despite the fact that the primary pregnancy “service” Planned Parenthood offers is abortion. This bias invalidates the “counseling” because the organization clearly has a material interest in encouraging every pregnant woman to schedule an abortion. According to Planned Parenthood’s 2014-2015 annual report, they served approximately 2.5 million people and performed 323,999 abortionsbut provided only 17,419 prenatal visits. And how many of those prenatal visits entailed “counseling” a mother to choose abortion rather than to choose birth? If Planned Parenthood declines the compromise, the taxpayer funding should be allocated to the 9,800 Community Health Centers in rural and urban communities around the country that provide comprehensive medical care and other health care to more than 25 million people, far beyond the minimal reproductive services provided by Planned Parenthood to only one-tenth as many people. Will You Help Us Build A Whole Life Movement? 1. Use Social Media! Use our hashtag #ChooseBoth to show that we support both the mother and the child, as well as #OpenTheBigTent to show the Democratic Party that our voices demand to be heard! Tweet at us @demsforlife your pictures from the March For Life or other events. Add your thoughts on why you're a Pro-Life Democrat! 2. Call Your Elected Officials! The House passed H.R. 7, the No Taxpayer Funding For Abortion and Abortion Insurance Full Disclosure Act, on January 24, 2017, by a vote of 238 to 183. The legislation would make the provision known as the Hyde Amendment permanent law. It would also clarify that federal funds are not allowed for abortion in plans included in the Affordable Care Act. Now it is the Senate's turn. Contact your U.S. senators and urge them to bring the legislation up for consideration before the full Senate. Democrats For Life also would like to thank the following Pro-Life Democrats in Congress who voted YES on this legislation. Be sure to contact them and thank them for their courageous vote! 3. Make A Donation To Democrats For Life of America and volunteer! 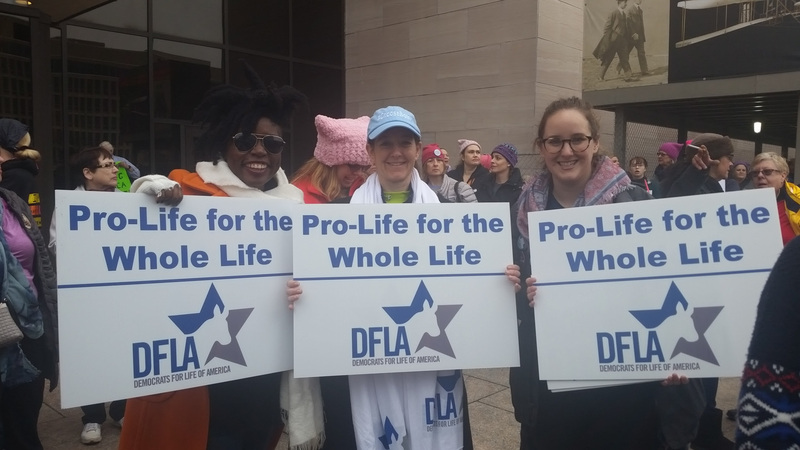 Democrats For Life of America is working hard to promote the Pro-Life view within the Democratic Party, and to provide for both the mother and the child. We need y our help to keep up with growing interest in our organization. We need to raise $600 per month for our part-time State Chapter Coordinator. So far, we have raised $420 for the position for this month. There's still a long way to go! 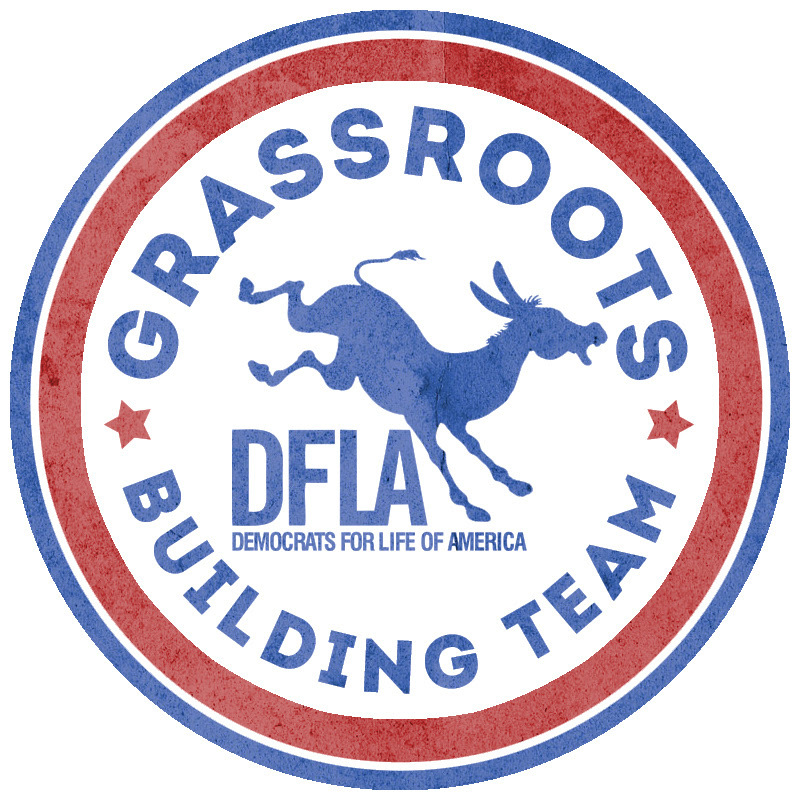 Please consider a contribution to our Grassroots Building Team.Or make a general contribtuion to Democrats For Life. Every dollar counts to help grow a Whole Life Culture in America today, and we need your help. Will you donate to help DFLA today? We also need support in individual states to build up our state chapters. Please consider volunteering your time and efforts! Your membership will expire one year AFTER your last donation, which was on 1/3/2017 for $22.00. If this information is incorrect, could you please reply to this email with your updated information? Lori Harimann of South Bend, Indiana, has written a great op-ed piece in the South Bend Tribune about what it means to be a Pro-Life Democrat, and why the party should open the big tent if they want to succeed again! Read it here! In this write-up for the National Catholic Reporter, Michael Sean Winters writes about how the Pro-Life Movementneeds to disavow the attitude and comm​ents on women of Donald Trump as the standard-bearer of the movement. We agree! Check it out! Washington, D.C. – Pro-life Democrats in Michigan asked a simple question of its leadership – include pro-life Democratsin the big tent of the party of diversity and inclusion. The answer was a stunning no. Pro-life Democrats focus on programs to support pregnant women, such as paid maternity leave, support for parents who receive a prenatal diagnosis, prenatal and postnatal care, affordable childcare, and other efforts to support pregnant women and new parents. Former State Representative John O’Neill has been leading the effort, and he made the case before his local party. They recognized the importance of not alienating members of their own party. John then took the next step, taking the resolution to the Michigan Democratic Party. The Leelanau resolution was rejected by the Michigan Democratic Party’s Resolutions Committee, but O’Neill hopes to find a way to introduce it on the floor at the Michigan Democratic Party Spring State Convention at Cobo Hall in Detroit this Saturday, February 11, 2017. Pro-life Democrats are not asking the Michigan Democratic Party to change its stance on choice, but only to add language to welcome pro-life Democrats under the big tent. The Michigan Democratic Party has mirrored the national party’s downward trend. Nationally, Democrats have lost more than 1,000 state legislative seats, and the party is at its lowest numbers since the beginning of the 19th century. Michigan is one of 27 states in which Republicans control all three branches of state government. Millennials are more pro-life than any generation before them since Roe v. Wade, but they feel as if they are at a loss when it comes to finding a political party to support. One in three Democrats are already pro-life, and most Americans in the middle support pro-life policies, such as the halting of federal funding for abortion. But the Democratic Party keeps rejecting its pro-life base in favor of extremist positions, further alienating Americans and risking the future of both the party and the country. Since the national party abandoned the 50 State Strategy that would have supported pro-life candidates, the Democratic Party has lost 912 state legislative seats and the control of 30 state legislative chambers, 69 U.S. House seats, 13 U.S. Senate seats, and 13 governorships. "The Democratic Party is in deep trouble," said former Michigan State Rep. Joel Sheltrown. "We have one Democratic representative north of US 10, and if we continue to push away members of our own party, we will remain a minority party. People who are pro-life make sure they get to the polls and vote. We need those votes to win. And, right now, those pro-life Democratic voters are not supporting our party."